Yesterday and Tomorrow is Today! 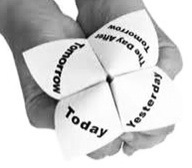 And this is what came to mind… If we live in the moment of today and it’s called the Present because it is a gift. Today, that gift to open is to be lived. Then we must live everyday, yesterday and tomorrow as a Today.